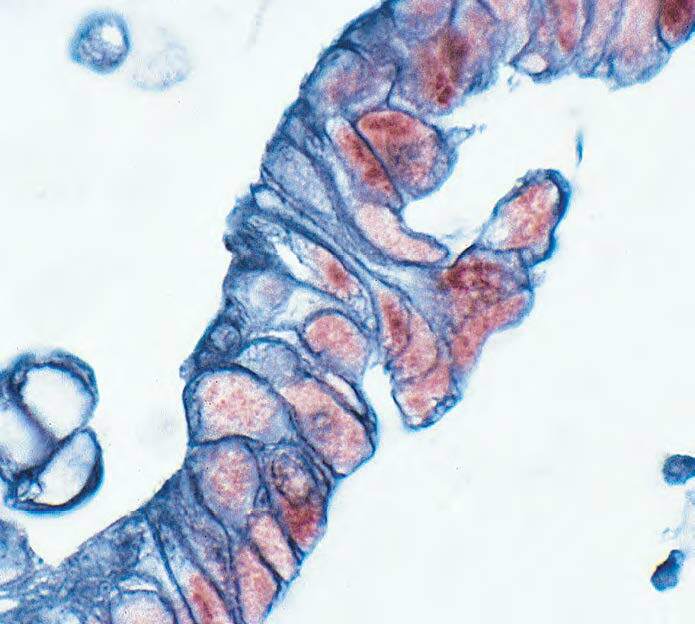 ABC-based detection is one of the most widely-used methods for staining. These systems exploit the high affinity exhibited between the protein avidin and the vitamin biotin. Avidin is tetravalent, so each avidin molecule can bind up to four biotinylated conjugates. In ABC systems, avidin and biotinylated enzyme is combined to form large macromolecular complexes containing multiple enzyme molecules. These added complexes bind to any biotinylated target, such as primary or secondary antibodies, nucleic acids, lectins, and macromolecules. When the chromogenic enzyme substrate is applied, it yields a colored precipitate at the site of the reaction. The large multi-enzyme complexes amplify the signal, providing greater sensitivity. Tumor: • p53 (m), VECTASTAIN® Elite® ABC Kit, Vector® NovaRED™ (red) • Cytokeratin (s), VECTASTAIN® Elite® ABC Kit, Vector® SG (blue-gray).